The delivery of events and the associated use of an online registration system require strict management, as well as the co-operation of the users to maximise the benefit. We therefore request that the following is read, and agreed to before proceeding. IAIAsa is a Voluntary Association (VA) for Integrated Environmental Management Professionals. We collaborate with various other professional VAs to bring our members and associates top quality events. Our objective is to promote and develop good professional practice within the environmental workspace comprising the biophysical, social and economic environment and its associated disciplines. IAIAsa strives to offer at least 4 events per financial year to its members. These events are funded by membership fees. 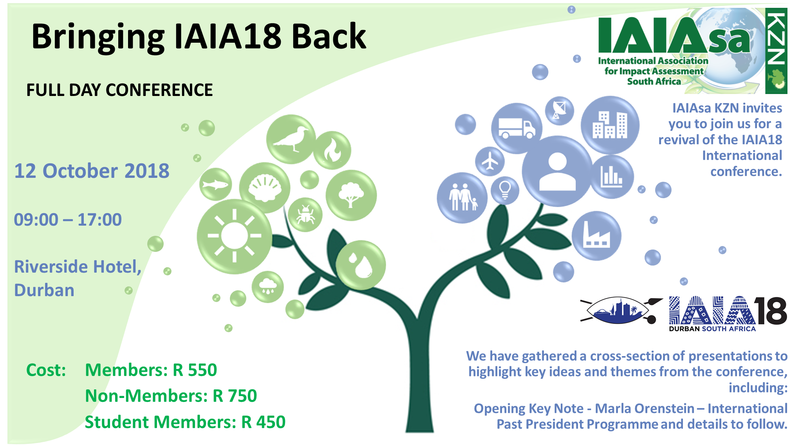 The organisation of these events generates a cost to IAIAsa. To ensure membership funds are not wasted members registering for these events will be invoiced and expected to pay for a ‘no-show’. There is a de-registration option should a member realise by the advertised cut off date that they can no longer attend the event. Non-member attendance at events will always attract an entry fee. No refunds will be provided, however delegate substitutions will be accepted. Branches may offer more than 4 events in the financial year. All additional events (over and above the 4 free member events) will attract an entry fee for all delegates. Members are requested to take note of the Entry Fees when registering for the Event on offer. The decision on which events are free and which are paid is at the Branch Committee’s discretion. Their commitment is to offer one free per quarter in no particular order. All entry fees are quoted inclusive of VAT. 1. Accept conditions of website entry and complete registration form. 2. An email will be sent to you confirming receipt of entry. 3. Your membership status will be confirmed and an Invoice will be generated and sent to you for payment based on the Association’s membership records. 4. Please pay your invoice as soon as possible, and send proof of payment to the regional co-ordinator listed on the invitation as places will be allocated on a first come first served basis, according to payment received. 5. An email will be sent to you confirming your registration. 6. Proof of registration must be brought to events to gain entry. 7. If you are unable to complete this process for whatever reason you are welcome to call the office or your regional event co-ordinator for assistance.